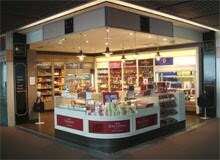 French travel retailer Aelia Group has introduced Parisian fine food and confectionery brand Dalloyau for the first time in duty-free and travel-retail it its new fine food store at Paris Charles de Gaulle airport satellite terminal S3, which handles Air France long-haul flights. The 40sq m (430sq ft) outlet opened on April 30 and also features a range of high-end French brands including Fauchon, Maxim’s, Marquise de Sévigné and Valrhona, plus leading Belgian chocolates brand Godiva. The store stocks typically French delicacies such as foie gras, cheeses, mustard and other condiments. The Dalloyau counter offers fresh macaroons, chocolates and pastries, and hopes to capitalise on the brand’s strong following in Asia, according to Aelia. The brand operates 32 stores worldwide including 14 in Japan and 10 in South Korea.